This one is a SHOWSTOPPER! October’s WWE DVD titles just kicked off with “Shawn Michaels – The Showstopper Unreleased” which hits stores today across the United States ($17.89; Amazon.com) and landed yesterday in the United Kingdom (£24.99; Amazon.co.uk). On the official release day WrestlingDVDNetwork.com has your first look photos of the final product. And if you particularly like the cover artwork WWE went with here, you can own the 3-disc DVD set with a bonus poster of that artwork, available exclusively through WWEDVD.co.uk. Unreleased no more! 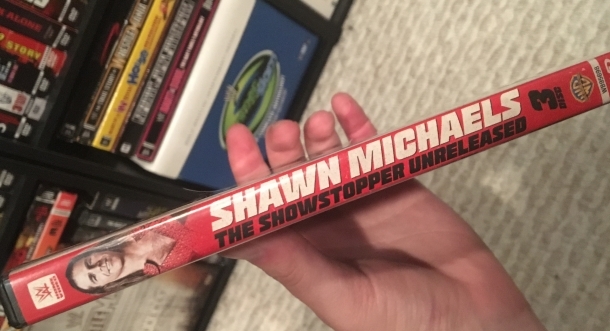 Today’s “Shawn Michaels – The Showstopper Unreleased” DVD digs deep into the vault to unearth more than 30 Shawn Michaels matches that have never seen the light of day on Home Video – or in many cases never seen the light of day period – before now. On top of those are a few non-match segments, lots of recent backstage footage of HBK working with the NXT stars, and of course a brand new interview with Shawn that’s also exclusive to this Home Video. We’re talking hours and hours of rare content that spans HBK’s entire career, with the selections beginning in 1985 and running all the way through to 2009 — footage from Mid-South Wrestling, early tag matches featuring The Rockers, matches in which he teamed up with Bret Hart and The Undertaker, unseen D-X action from the Attitude Era, battles with legends the likes of Stone Cold Steve Austin, Ric Flair, Jake “The Snake” Roberts, Mr. Perfect, Vader, Yokozuna, Chris Jericho and Kurt Angle, and even a non-televised Piper’s Pit in which Shawn was the special guest! The U.S. release pictured in today’s update comes packaged in the now-standard, slimmer Amaray style case with a double-sided paper insert found inside which details the full content of all three discs. Those discs themselves are once again ‘stacked’ together in one holder. A special thanks to WDN reader Matthew Tremble for swiftly sharing these pics. – UK/Europe: RIGHT NOW! Get the HBK Unreleased DVD over on Amazon.co.uk. – USA: RIGHT NOW!. Pre-order the HBK Unreleased DVD now here on Amazon.com. WWESHOP DEAL: The DVD and Blu-ray section of WWEShop.com has been whittled down to just 3 titles left in stock — but right now you can still find a helluva deal there. You grab the “NXT: From Secret to Sensation” DVD – 3 discs featuring a countdown of the greatest NXT Superstars and a collection of 18 matches – for just $4.95! I can’t find it either and even Amazon is hard tracK down. Well, it could have been used as another great unreleased match instead! After watching the first 4 matches on Disc3 today, I was certainly impressed with the first 2! 3rd was good & the 4th vs Flair okay too packed with Flair’s “WOOO’s”!!! I was certainly impressed after seeing the flying dropkick given by Michaels to Y2J as he was coming down on him from the top rope! I’ve just seen the first 2 discs so far & I’ve had a great time with some of the matches! I must admit the start was a little boring (first match) as well as the tag match against the Hart Foundation! I was expecting that one to be awesome, but it was very boring! Though I loved the first tag match against the Demolition, the match against the Natural Disasters & the Legion of Doom! Disc2 was better whilst bringing back a glimpse of the original Heartbreak Kid making almost all the matches fun to watch! The Michaels & Diesel ‘Face to Face’ was fun watching! Michaels Vs the 123 Kid was great! As well as Vs Austin, Yokozuna & the Brooklyn Brawler! The worst match on this disc was the 6man Elimination match! Shawn n Bret’s Tag match was another great match though as well as Mr Perfect! It’s a shame they don’t put any thought into the disc designs nowadays. Every release this year has pretty much looked the same. Still looking forward to this set though. I do like the way that the discs are divided up with his tag team career, first singles run and second run each having their own disc. WHAT?! That I’d say is too late! And of course the one match that was very much released worldwide on the New and Improved DX DVD! Still wondering why on earth that’s on there. Which match are you referring to? @SCSA The Texas Tornado tag match from the October 2, 2006 Raw was already released on The New & Improved DX DVD. I agree, but at least the match is only three minutes or so. A grand total of 35 matches complete with interviews and segments. This is a great set. I knew I should of ordered through Amazon. I went to my local Best Buy, Wal-Mart & Target and no one had it in stock. I’m dying to watch this! I find FYE to be one of the most underrated stores out there. I’ve been ordering from them for years as the three in my area all closed down. They ship quick and often have great deals that really knock the price down. I ordered a few things the other day as I was behind on some DVDs and grabbed the new Summerslam 3 disc set for $16, which I thought was pretty good for a brand new, newly released set. I got my copy a day early via Best Buy. One of 2018’s best sets. yeah i been to walmarts every where and not 1 single one has it in stock this week ?